Primary endocrine therapy (PET) is a treatment option for elderly patients with ER-positive breast cancer enabling frail patients to avoid surgery. As a long-term treatment option, it has been shown to be inferior to surgery in controlling local disease. Decision-making in these patients is crucial in avoiding treatment failure. We examined the influence of decision-making on outcomes of PET failure as a secondary analysis as part of a large observational study. 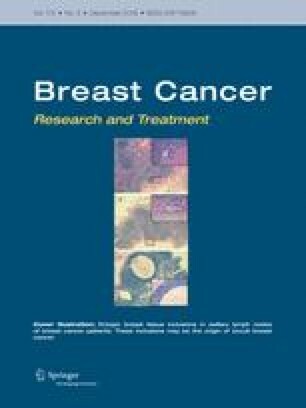 Consecutive patients treated with PET between 2005 and 2015 for operable breast cancers were included in a retrospective observational study in 3 breast centres in the North-East. Treatment decision processes were examined by case note review and outcomes of treatment success or failure recorded. 488 patients were included with mean follow-up of 31 months. Overall 63 (12%) experienced treatment failure. 227 (46.6%) were given a choice between surgery and PET at diagnosis. Logistic regression identified older age [OR 0.94 (0.91–0.96) p < 0.001] and reduced mobility [OR 0.6 (0.37–0.97) p 0.036] to be less likely offered surgery. Those offered surgery were more likely to experience treatment failure with PET [SHR 1.78 (1.05–3.02) p 0.033]. Despite a low failure rate in our series (literature failure rates vary between 12 and 85%), these results suggest that those actively offered a choice between surgery and PET are at greater risk of failure when choosing PET. RT and HC were responsible for the study concepts and design. Data acquisition was performed by RT and RR. Data and statistical analysis was performed by SC. Manuscript preparation, editing and review were performed by RT, RR, SC and HC. No external funding or sponsorship was received by any author for the conduct of the study. HC receives honorariums and travel expenses from Roche Products Limited, Pfizer Inc. and Baxter Healthcare; no other relationships or activities exist for all other authors that could appear to have influenced the submitted work. No ethical approval was required for this retrospective study.